Italian jewellery brand CHIMENTO had its beginnings in a goldsmith workshop in Vicenza. In time, they were well known in all of Italy and beyond. The skill, creativity, and innovation, combined with exquisite materials and modern trends makes the Chimento style unmistakable. It is elegant yet relaxed at the same time. Chimento chose 2018 for their debut at Baselworld, and they did not disappoint. The two collections perfectly showcased their exquisite craftsmanship and dazzling gems. Let’s take a closer look, shall we? The roaring ‘20s come alive, come alive in this Italian Art Deco collection, the BAMBOO FLIRT. The lines are natural and smooth, a sleek refinement of the original BAMBOO collection. The pristine reshaping of the silhouette may seem minimalist at first, but then you realize it is just what you needed. Not a complete rebirth, just a reawakening. The pieces themselves are wonder to behold. There are several necklace styles to choose from. Similar yet dissimilar, all beautiful. There is simple necklace with a bamboo pendant at the end. The bamboo dangles in a very relaxed way, and reminds you of the spa or the mountains. The necklace with a horizontal bamboo segment is modern and upbeat. The long necklace is a good choice for a statement piece, and the tassel at the end is pure luxury. 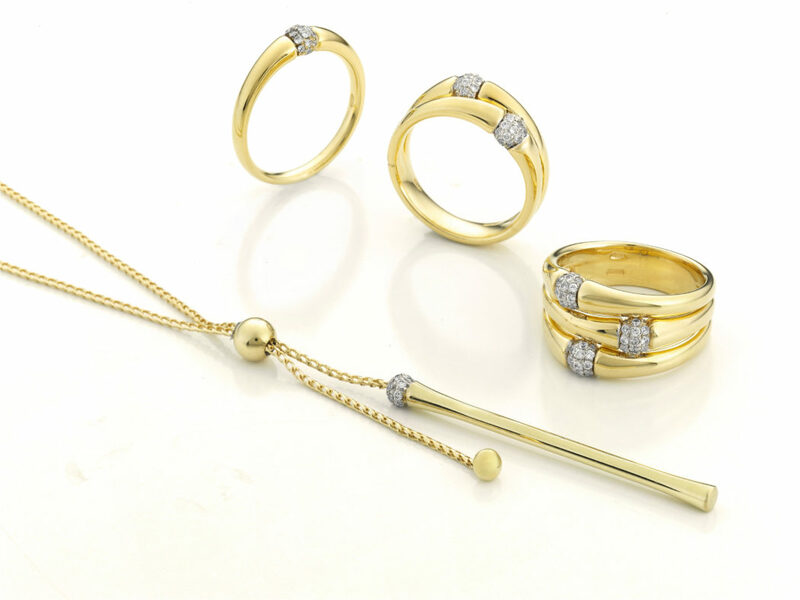 There are rings in this collection too, and they are made to look like slender individual bamboo shoots, topped with some sparkle. The classic one band, or two, or three, the choice is yours to make. 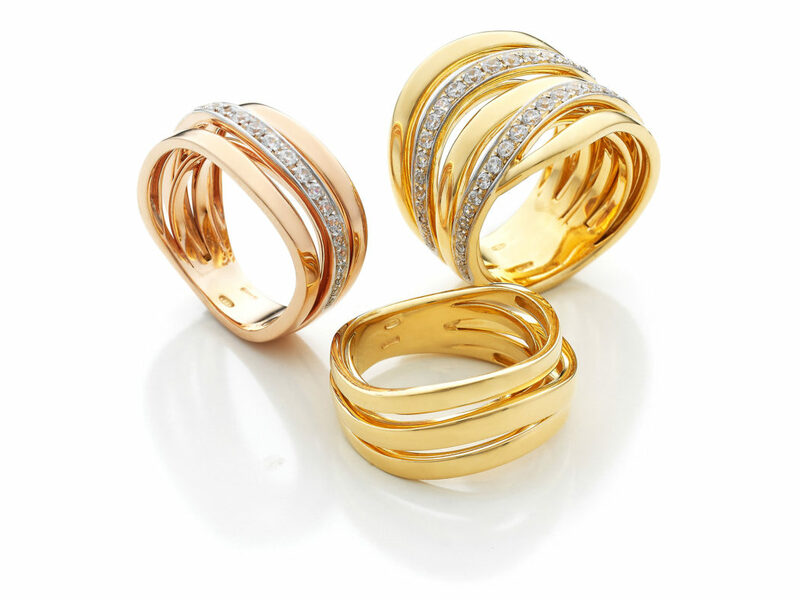 Another choice you will need to make is the type of gold that catches your fancy – 18k gold in yellow, white, or pink. 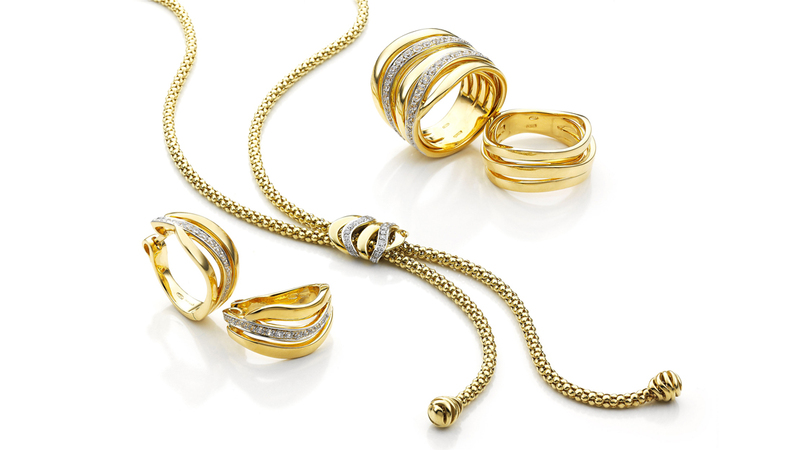 Each piece can be made that much more special with white diamond micro pave. Nearly three decades ago, the Chimento Stretch Classic collection was a patented and technologically revolutionary collection due to the softness and flexibility of the stretchy pieces. Chimento has chosen to use the same technology but updating the look for the modern woman. Imagine an evergreen, organic collection come to life, and you’ll have the STRETCH NUVOLA line. The soft wavy lines are a breeze. Wouldn’t you know it, ‘nuvola’ is Italian for ‘cloud.’ The perfect name for a collection that would be easy to pair with any outfit or mood. Their rings are slow undulations of the clouds that pass above, sometimes with gaps between to let the real you peek through. Some of the twists have diamond pave, and some don’t. The necklace, with its beautiful chain, is brought together by the same could-like wisps. Indeed, this collection is a dream. CHIMENTO has proven they are worth the time to explore. I can’t wait to see their next collections. In the meantime, I hear a Bamboo Flirt ring calling my name.